Southcentral Pennsylvania Pumpkin Patches, Corn Mazes, Hayrides and More - Find Halloween and Fall Fun! Looking for a local pumpkin patch, corn maze, hayride, gourds and other Halloween activities in Southcentral Pennsylvania? Scroll down this page and you will see the all of those in Southcentral Pennsylvania, sorted by county. Some are farms, where you take a hay ride out into the field, others are elaborate farm stands with mountains of pumpkins and other activities and some are simple roadside stands. Most have loads of pumpkins to choose from. To really make it fun for your kids, look for those that have the extra activities, like a corn maze, spook house, or hayride. There is usually a small fee for the mazes (of course, the more elaborate mazes tend to charge more. Hayrides are often free. ALWAYS call before you go to confirm the info, they don't always report changes to me! 984 Carlisle Road, Biglerville, PA 17307. Phone: 717-677-6536. Fax: 717-677-6376. Email: melissaallen23@gmail.com. Directions: Located two miles north of Biglerville on Route 34. And for a map to our farm, click here. Crops are usually available in May, June, July, August, September, October. Open: Monday - Sunday, 9am to 5pm. Payment: Cash, Check. 1246 B Route 194 N, Abbottstown, PA 17301. Phone: 717-259-9500. Alternate Phone: 717-524-7076. Email: buttercupbakeryfarmmarket@gmail.com. Open: Tuesday to Thursday, from 9 am to 5 pm; Friday from 9 am to 6 pm; Saturday from 8 am to 6 pm; Hours subject to change. Click here for current open hours, days and dates. Directions: Click here for a map and directions. We use natural practices, but are not yet certified Organic. Payment: Cash, Visa/MasterCard, Discover, AmEx. Stop by and see what all we have to offer. 350 Forest Drive, New Oxford, PA 17350. Email us at: gwolf113@earthlink.net . And for a map to our farm, Click here. Check website for our current hours! 545 Carlisle Road, Biglerville, PA 17307. Phone: 717-677-8412. Alternate Phone: 717-677-9494. Fax: 717-677-7157. Email: info@hollabaughbros.com. Open: Monday to Wednesday, from 8am to 6pm; Thursday from 8am to 7pm; Friday and Saturday from 8am to 5pm; Sunday from 12pm to 5pm; Ice Cream Window open daily from 7pm to 9pm; Please check our website for all of our hours year round. Click here for current open hours, days and dates. Directions: Click here for a map and directions. We use integrated pest management practices. Payment: Cash, Check, Debit cards, Visa/MasterCard, Discover. Click here for our Facebook page. Hollabaugh Brothers is a three-generation, family-owned and operated fruit and vegetable farm. Growing on 500 acres, the Hollabaugh family grows a wide variety of fruits and vegetables, including small fruits, apricots, plums, peaches, pears, Asian pears, apples, melons, cut flowers, and more! A retail market provides the freshest produce throughout the season, as well as home-made baked goods, jarred goods, and a country gift shop. 545 Carlisle Road, Biglerville, PA 17307. Phone: 717-677-8412. Fax: 717-677-7157. Email: info@hollabaughbros.com. Directions: Located nine miles north of Gettysburg right on route 34. Just a short drive from Route 15, Route 30, and Interstate 81. Click here for a map and directions. Crops are usually available in May, June, July, August, September, October, November. Open: Monday through Thursday, 9am to 6pm Friday and Saturday, 9am to 5pm Sunday, 12pm to 5pm; wagon rides on select weekends (please call for dates and times). Payment: Cash, Check, Visa/MasterCard, Discover. 4 Irishtown Rd, Hanover, PA 17331. Phone: 717-637-8848. Email: kandjfarm@yahoo.com. Open: Please call for PYO dates and times. Directions: From Hanover or Gettysburg take Route 116 to Centennial Road. Follow Centennial Road for approximately 1.5 miles. Our Market is on the right hand side. Click here for a map and directions. We use natural practices, but are not seeking organic certification. Payment: Cash, Check, Debit cards, WIC Vouchers, SFMNP Vouchers. 351 Speelman Klingler Road, Gettysburg, PA 17325. Phone: 717 334-5259. Email: info@mtjoyberryfarm.com. Open: Call Mount Joy farm for picking hours and field conditions or Click here for current open hours, days and dates. Pumpkin updates: Click here for updates. Directions: from Gettysburg, 5 miles south on 97 turn right onto Hoffman Home Road. Less than a mile turn left onto Speelman Klingler Road. Farm is first entrance is on the left. Click here for a map and directions. Strawberries: mid May - end of June, Blueberries: mid June - end of July; Raspberries: July - frost; Pumpkins: September - October. We use integrated pest management practices. Payment: Cash, Check. 2278 Hanover Road, Gettysburg, PA 17325. Phone: 717-338-1696. Email: OldSwordFarm@embarqmail.com. Open: Thursday and Friday from 5 pm until 9 pm; Saturday from 10 am until 9 pm; Sunday from 2 pm until 5 pm; All other times by reservation. Pumpkin updates: Click here for updates. Directions: From the center circle in Gettysburg take Pennsylvania Route 116/ Hanover Road, heading East for 3.9 miles. Pass East Cavalry Battlefield. Pass Low Dutch Road and turn left into the driveway immediately before the stone house. Old Sword Farm is on the corner of Low Dutch Road and Hanover Road/Pennsylvania Route 116. Click here for a map and directions. Corn maze is open from August 27, 2010 through harvest in October; (Please call if you are coming in mid to late October; This corn is used to feed our farm animals;). Payment: Cash, Check. Pick your own deer/squirrel corn. Hayrides are available upon request or reservation. We are happy to accommodate your group by providing a campfire, table with table covering, sticks for roasting marshmallows, electricity, and up to two 20 cup hot water pots with hot water ready for you. Call in advance to make arrangements. The stone farmhouse was a field hospital during the Gettysburg battle of the Civil War. From the property you can see the monument where General J.E.B. Stewart and General Custer faught in a cavalry battle. 64 Tree Lane, Aspers, PA 17304. Phone: (717) 677-0093. Alternate phone: (888) 677-0093. Email: info@fieldsofadventure.com. Open: Starting September 4, 2010, See their website for for hours and availability. Directions: See their website for directions. Payment: Cash, only..
A visitor writes on July 12, 2010: "I know the owners of this venture, this is their first year. I am excited about a corn maze in this area; this one will be good for families with multiple-age children because of the variety." 232 North High Street Arendtsville, Biglerville, PA 17307. Phone: 717-677-0831. Email: swartzspumpkinpatch@gmail.com. Open: Call first for pumpkins. Directions: From the gas station in Arendtsville, travel 3/10 mile west on route 234 to our driveway on the left. Click here for a map and directions. In the Spring, we also have strawberries; Strawberries generally run from the third week in May thru the middle of June; Black raspberries generally run from the last week in June thru about July 10th. Payment: Cash, only. 486 Cooks Mills Rd., Hyndman, PA 15545. Phone: 814-842-6180. Email us at: drybonesmaze@excite.com. Directions: located just off route 96. Cooks Mill is 5 miles south of Hyndman, pa. or approx 10 miles north of Cumberland Md. follow signs. And for a map to our farm, click here. Crops are usually available in October. Open: Monday to Friday 5pm to 11pm. Saturday and Sunday 2pm to 11pm. Open October 13 and 14 and from the 19th to the 31st. Payment: Cash, only. also featuring avrils asylum. 7880 Barker Rd, Alexandria, PA 16611. Phone: 814-832-3430. Fax: 814-832-2988. Email: JBTreeFarm@aol.com. Directions: Conveniently located on US 22, 13 miles west of Huntingdon, PA & 13 miles east of Hollidaysburg, PA. Click here for more detailed directions. Open: weekends beginning Friday, September 21. Groups interested in a private party or school group tour please call for availability, 814-832-3430 or 888-826-9928. Also hot dog roasting, then find the correct path through Music Mystery corn maze and complete the game card. In addition to a great selection of all sizes of pumpkins, we will have bonfires, reindeer to visit, a fun pumpkin bus to ride, a harvest play area and picnic areas, as well as a large selection of decorative crafts, hard-shell gourds, See these pages for more information about: The Farm and Reindeer and Christmas Shop. Port Matilda, PA 16870. Phone: (814)692-5211. Open: 8am-6pm Monday-Friday 8am-5pm Saturday. We start selling pumpkins in late September and continue until October. We also have a fall festival in October that you can get a wagon ride out to our patch and pick a pumpkin from the field yourself. See the Fall Festival page for more information. Every year Way Fruit Farm hosts a Fall Festival on the 2nd and 3rd Saturday's of October. The Festival is a great time to come out with family or friends and take a free wagon ride out to the pumpkin patch and pick just the pumpkin you want. There is also numerous other things to do at the festival. There is an apple slingshot, over a dozen crafters and other activities to enjoy. Food is provided by a local Lions Club and baked goods including apple dumplings are available. The best part of it all is that 10% of all the earning's on both Saturday's will go to an orphanage in the Dominican Republic. A visitor writes on October 11, 2008: "Maze is fun for younger kids especially, friendly farm cats and dog; kind of sad that the cattle were so confined; we enjoyed it except for that "
2191 West Whitehall Road, State College, PA 16801. Phone: 814-238-8349. 100 acre farm, located just a few miles from downtown State College on West College Avenue (Route 26). Specializing in all seasonal fresh fruits and vegetables. Family and group programs available in the fall include hayrides, pumpkin field, corn maze, and much more. A visitor writes on October 11, 2008: "Only went once...had fun but was crowded so didn't stay long"
2355 Halfmoon Valley Rd, Port Matilda, PA 16870. Phone: 814-692-5211. 8am-6pm Monday-Friday 8am-5pm Saturday. 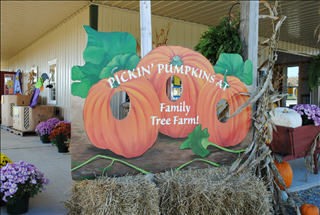 Every year Way Fruit Farm hosts a Fall Festival on the 2nd and 3rd Saturday's of October. The Festival is a great time to come out with family or friends and take a free wagon ride out to the pumpkin patch and pick just the pumpkin you want. There is also numerous other things to do at the festival. There is an apple slingshot, over a dozen crafters, a petting zoo and other activities to enjoy. Food is provided by a local Lions Club and baked goods including apple dumplings are available. The best part of it all is that 10% of all the earning's on both Saturday's will go to an orphanage in the Dominican Republic. So come in join us this October in this annual tradition and have a great time with your family and friends. A visitor writes on October 11, 2008: "FUN!!! A good cause, their apple butter is the best!" 270 White Church Road, Elysburg, PA 17824. Phone: 570-799-5888. Alternate Phone: 570-799-5887. Email: ponduce1@yahoo.com. Open: Monday, Tuesday, Thursday from 10 am to 7 pm Friday, Saturday from 10 am to 8 pm Sunday 8 am to 6 pm. Click here for current open hours, days and dates. Directions: 1 mile off route 42 in Numidia. Click here for a map and directions. Payment: Cash, Check, Debit cards, Visa/MasterCard, Discover. Click here for our Facebook page. 240 Southern Drive, Catawissa, PA 17820. Phone: 570-356-7654. Email: rohrbach@ptd.net. Open: PYO pumpkins Fridays and Saturdays in October 10 am to 7pm. Directions: 240 Southern Drive Catawissa, PA 1720. Click here for a map and directions. Payment: Cash, Check, Debit cards, Visa/MasterCard. 906 W. Grantham Road, Mechanicsburg, PA 17055. Phone: (717) 766-7611. Fax: (717) 766-3750. Email: andrea@ashcombe.com. Open: October Monday to Saturday 9 am to 8 pm. Click here for current open hours, days and dates. Directions: FROM HARRISBURG AND POINTS NORTH Take Route 581 to Route 15 south. Take the Lisburn exit off Route 15 south. Turn right at the first light, then left at the second light onto Gettysburg Pike. At stop sign, turn right and continue 1 mile to Ashcombe, on the right. Click here for a map and directions. Payment: Cash, Check, Debit cards, Visa/MasterCard, Discover, AmEx. Click here for our Facebook page. 6080 Creekview Road, Mechanicsburg, PA 17050. Phone: 717-576-0787. Email: tombafarm@verizon.net. Open: Monday to Friday 10 am to 6, Saturday 10 am to 5, Sunday 12 pm to 5. Directions: Click here for a map and directions. Payment: Cash, Check, Debit cards, Visa/MasterCard, Discover, AmEx. 1216 South York Street, Mechanicsburg, PA 17055. Phone: 717-697-4330. Email: paulusamy@aol.com. Directions: And for a map to our farm, click here. Crops are usually available in July, August, October, November, December. Open: Monday to Friday, 9 to 7, Saturday 9 to 5 and Sunday 11 to 4 during normal most of the year; Winter hours Thursday and Friday 9 to 5 and Saturday 9 to 3. Payment: Cash, Check, Debit cards, Visa/MasterCard. 13374 Lurgan Road, Newburg, PA 17240. Phone: (717)532-5537. Open: fall fest dates and hours October 5th, October 12th, October 19th, and October 26th each of these Saturdays from 10am till 4pm. Directions: call for directions from your location. Click here for a map and directions. Free hayrides through "scarecrow hollow" a fun family excursion; The ride will drop you off at the pick your own pumpkin patch and then return to our retail store; At the store we have mums, straw bales, cornshocks, gourds and other fall decorations; We also have fresh bake goods, jams and jellies, antiques and country collectables. Payment: Cash, Check, Debit cards, Visa/MasterCard, WIC Vouchers, SFMNP Vouchers. 3746 Etter Road, Chambersburg, PA 17202. Phone: 717-729-5343. Email: ccproduce07@gmail.com. Open: Monday to Saturday 10am to 6pm, or until Dusk, September 1 to November 3; Closed Sundays. Directions: Click here for a map and directions. Payment: Cash, Debit cards, Visa/MasterCard, Discover. Click here for our Facebook page. A visitor writes on October 09, 2010: "Me and my family went there today my daughter enjoyed herself (she is 2). We walked threw the patches and picked our own pumpkin the price for a pumpkin is 45 cents a pound and a lot of the ones in the field will run you about 7 dollars up; they are nice size ones and healthy looking. They have a lot of great ones but if you want smaller ones they are out in the field you have to look hard for them but they also do have some picked already under the tent. They also have a lot of nice backgrounds to take pictures in front of., I loved it and I will go back every year it's a new family tradition." A visitor writes on October 04, 2009: "me and my girlfriend went to the Reynolds Farm today. it was our first time there and it was awesome. great place to take the family"
A visitor writes on October 07, 2008: "I have gone to the Reynolds farm for 2 years in a row and will continue to return every year with my family. They have a large pumpkin patch, mums, and many different fall items for sale including the greatest apple cider! You can enjoy a hayride to the pumpkin patch and pick your own pumpkin or find one under the tent. They have a great play area for young children, slides, corn maze and a hay maze for younger children, you can feed the goats, and see a few farm animals. They have portapots, play area, hay rides, corn and hay mazes, slides, swings... They do take credit cards.. "
7678 Oellig Road, Mercersburg, PA 17236. Phone: (717) 328-3617. Email: stonersdairyfarm@gmail.com. Open: August 28, 2010 to October 31st on Saturdays from 10:00 am to 5:00 pm; Sundays from 12:00 pm to 5:00 pm; last admission will be admitted no later than 4:30pm. Directions: Call for directions. Payment: Cash, Debit cards, Visa/MasterCard. Admission includes: 5-acre Corn Maze, Petting Area, Play Area, Photo Opportunities, and Hayrides. Corn Cannon, refreshments, pumpkins, and fall decorative items are available for an additional fee. Corn Maze, petting area with 2 day old calves, chickens, bunnies, goats, etc. playground area. Ice cream. Corn Cannon. Admission is $5/person for visitors 3ft. & up. Group discounts are available. Click here for more information. A visitor writes on October 05, 2010: "Our family loved it!" US 22, Alexandria, PA 16611. Phone: 814-832-3430. Fax: 814-832-2988. Email: JBTreeFarm@aol.com. 204 Barnyard Boulevard, Lewistown, PA 17044. Phone: 717-437-3648. Open: Corn maze is open from September 11, 2010 to November 6, 2010; Our hours are Friday 4 pm to dark, Saturday 12 pm to dark; We are open until 10pm for moonlight maze on October 22&23. Directions: Click here for a map and directions. Payment: Cash, Check. 34 Eberman Lane, Lewistown, PA 17044. Phone: 717-543-0974. Email: gossfarms@verizon.net. Directions: And for a map to our farm, click here. Crops are usually available in August, September, October. Open: 7 days a week from 9am until dusk. 4803 Old Turnpike, Lewisburg, PA 17837. Phone: 570-524-9820. Fax: 570-524-0464. Email: info@ardsmarket.com.Open: Friday from 4 pm to 9 pm, Saturday from 12 noon to 9 pm, and Sunday from 12 noon to 6 pm. The Maze Park includes Large Corn Maze “Knights & Dragons”, a Children's Corn Maze, a Maze Mountain—a 95' underground tube slide, a Spider Maze, the Fun Barn, a Rope Maze. 2007 Admission fees: Full park admission prices: adults, $7.00; children ages 4-12, $6.00; Limited park admission (does not include the large corn maze) : $5.00 for all ages. 8892 Susquehanna Trail South, Loganville, PA 17342. Phone: 717-428-2036. Fax: 717-428-0320. Email: info@brownsorchards.com. Open: Year Round. Click here for current open hours, days and dates. Pumpkin updates: Click here for updates. Directions: Exit 8 or 10 off I-83. Click here for a map and directions. Strawberries end of May Cherries and Blueberries mid June; Apples September; Pumpkins October. Payment: Cash, Check, Debit cards, Visa/MasterCard, Discover, AmEx. Click here for our Facebook page. 4866 Route 30 West, Thomasville, PA 17364. Phone: 717-841-650. Alternate Phone: 717-841-6570. Email: Jmhacker@peoplepc.com. Open: September 1 to October 31, 7 days a week, please see visit us on Facebook for our current hours of operation. Directions: One half mile west of Route 116 on Route 30 at the KBS intersection in Thomasville, Pennsylvania. Click here for a map and directions. Payment: Cash, Visa/MasterCard, Discover, AmEx, SFMNP Vouchers. Charlie's Produce & Crabs is open seasonally from Mother's Day to Christmas featuring locally grown and harvested produce, seafood, flowers, pumpkins and trees as they becomes available throughout the seasons. 110 Ducktown Road, York, PA 17406. Phone: 717-252-2540. Fax: 717-252-2541. Email: enjoy@flinchbaughsorchard.com. Open: April through December; Monday to Friday, from 8 am to 6 pm; Saturday, from 8am to 4pm; Sunday closed. Click here for current open hours, days and dates. Pumpkin updates: Click here for updates. Directions: From York: Travel on Route 30 East to Hallam Exit. Right onto Frysville Roadd. Left onto Route 462 East. Travel 2.2 miles to Ducktown Road on right. Farm Market will be on right after one quarter of a mile. Click here for a map and directions. We use integrated pest management practices. Payment: Cash, Check, Visa/MasterCard, SFMNP Vouchers. Summer Fest is held every year the last weekend of July! A community event for families to enjoy. Click here for our Facebook page. Fall Fest in October. 2885 New Park Rd, New Park, PA 17352. Phone: 866-WE-LOSE-U. Fax: 717-382-4879. Email us at: michelle@cornmaze.com. And for a map to our farm, Click here. Crops are usually available in May, June, July, August, September, October, November. Open: The Maize Quest Adventure Park is open Fi-Saturday from 10 am to 10PM, Sun 1PM-7PM during the fall through November 13, 2005 Payment: Cash, Visa/MasterCard, Discover. Maize Quest is the largest collection of people-sized mazes in the world! Challenge puzzles built of Bamboo, fence, Rope, Stone, Tile, Mesh; roll GIANT inflatable rocks at BoulderDash, and get 'beeped' in the Invisible Fence Maze. Ride an 80-foot-tube-slide; even mine for gemstones! New Park Road, New Park, PA. Phone: 866-935-6738 or phone: 717-382-4878. Directions: Directions and map. Open: May 22 to August 7th Friday and Saturdays 10 am to 8 pm AND then August 7 to November 14th Friday and Saturdays 10 am to 10 pm. Ten mazes, including a gem mine maze, living bamboo maze, ever-changing fence maze, and the Maize Quest Pirate Adventure Cornfield Maze. For one admission ticket, you get all ten mazes. In the fall, jump and climb on our Giant Straw Bale Mazes. Everyone who is brave enough can slide down the Maze Mountain 80- foot-long tube slide. Younger kids aren't left out of the fun! We've created the Kid's Quest Mini-Maze exclusively for kids under 48 inches tall. You get all this, PLUS on August 7, we open Maize Quest's Dinosaurs! Cornfield Maze. It's the most interactive maze on the planet with games for every age level, so families can have fun together. Imagine your family emerging from the maze victorious together! 522 East Mount Airy Road, Dillsburg, PA 17019. Phone: 717-432-2544. Email: information@paulusorchards.com. Directions: Take Route 15 to the Mechanicsburg/Bowmansdale exit. Go towards Bowmansdale. Go straight for 3.2 miles (do not follow route 114 signs). Turn left onto E. Mt. Airy Road Drive a mile and a half to orchard. It will be on your right. Very close to Ski Roundtop. See link for other directions. Click here for a map and directions. Open: Monday to Friday, 9 am to 7 pm, Saturday, 9 am to 5 pm, and Sunday, 11 am to 5 pm (during the season, check our web site for exact dates). Farm Stand Open July to January Corn Maze is open on weekends in September and October U-Pick Apples and Pumpkins is open on weekends in September and October Birthday and Group Parties scheduled August through November Group Tours scheduled August through November. Click here for picking updates. Payment: Cash, Check, Visa/MasterCard. Paulus Orchards participates in the Farm Market Nutrition Program. 5594 Norrisville Road, White Hall, MD 21161. Phone: 410-692-2429. Email: shaw@shaworchards.com. Directions: From Baltimore, I 83 North to exit 36. East on 439 to Bond Road. Left on Bond and stay straight for 6 miles to Pa. Route 24. Right (South) on Rt. 24 (Barrens Road South) for about 2 miles. Market on the Right at the Mason-Dixon-Line. Open: Monday thru Friday 8 to 6 (8 to 5 in Nov.) Saturday 8 to 5 and closed Sunday Pick-Your-own Strawberries in Late May, early June. Pick-your-own Sweet cherries in June/July. Pick-your-own Blueberries June through August. Pick-your-own apples Friday and Saturday's in September and October. Payment: Cash, Check, Visa/MasterCard, Discover. We provide a weekly e-mail service called the RipeLine with up to the minute seasonal information. Sign up by going to Shaw Orchards and click on Ripeline at the lower right of home page.